A line of maple trees greets visitors inside this Korean barbecue hot spot in Itaewon. Grill your own meat over charcoal (aged hanwoo sirloin is the house specialty); then wrap it in lettuce and top it with the restaurant’s secret sauce and your choice of vegetables. The house specialty at this Gangnam restaurant is grilled eel, which is served with Japanese-style sweet soy sauce, gochujang (red chili paste) or salt. Sit Korean-style on the heated floor at low tables, and wrap each mouthful in fresh lettuce, ginger, garlic, chili and soybean paste. Wash it all down with sweet raspberry wine. Co-owned by Park Geun-ha, recipient of the 2014 Barista Champion of Korea title, this two-storied café offers single-origin coffee beans. But coffee isn’t the only draw here. Fritz is also famous for baked goods like flaky pain au chocolat and warm baguettes. Seoul’s fashionable set flocks to this luxurious lounge bar in the heart of Itaewon, one of the city’s best nightlife districts. The interior features dark walls, checkered flooring and a stark central bar with an ultrashiny metallic light fixture. This American bistro offers a customizable menu of comfort food staples. Keep homesickness at bay with brunch dishes, from eggs Benedict with hanu beef meatballs to fried chicken with pancakes, bacon and maple syrup. With its exposed brick walls, industrial-size windows and restored metal chairs, this pub feels like it’s straight out of Williamsburg, but that’s where the similarities end. Slow Village specializes in Korean-style liqueurs like makgeolli, a rice wine made with local rice and no artificial sweetener. Pair your drink with a plate of blanched tofu with sautéed beef and kimchi. Built at the end of the 14th century, Gyeongbokgung Palace was the first and largest royal palace erected by the Joseon dynasty. Over the last decades, the palace has undergone extensive renovations to restore its classic Korean architecture. Free English guided tours run three times daily, and admission to the palace is KRW3,000. 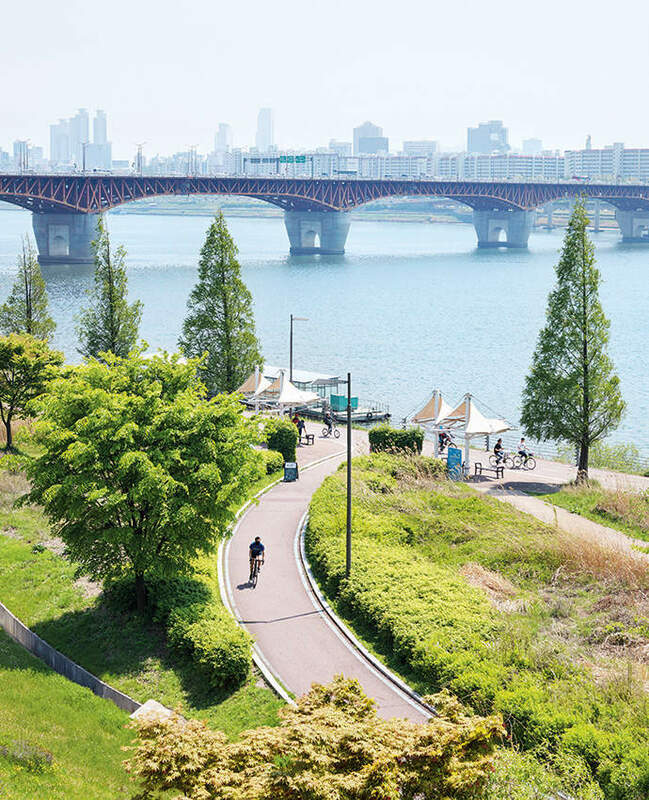 This 5.8-kilometre waterway, which runs through downtown Seoul, was created as part of the city’s renaturalization efforts. The stream is now a popular destination for locals and tourists who want to experience nature in the city (and spot orange carp). Visit the Cheonggyecheon Museum to learn more about the revival of this once paved-over waterway. Dating back to the Joseon dynasty, this historic neighbourhood reveals over 600 years of Seoul’s history. Stroll through the narrow streets of Bukchon to see hundreds of hanok houses made of stone, wood, rice paper and traditional sloping roofs. Several of these old houses have been restored and converted into cafés and art galleries. Designed by Zaha Hadid, Dongdaemun Design Plaza (DDP for short) is a cultural playground and one of Korea’s most iconic landmarks. Located at the centre of Dongdaemun, the DDP hosts a variety of shows, conferences, exhibitions and events focused on art and design. At this spa, located just 10 minutes from downtown in the shadow of Mt. Namsan, enjoy the apple green tea scrub or opt for the Tropical Rainmist experience (steam bath, invigorating body scrub and cascading rain shower). After a day of exploring the city, try the Foot Release, a 30-minute footbath and massage. The largest park in Seoul is famous for its scenic walking trails, featuring mineral springs and water-lily-covered ponds. Hike, walk or bike to the top of Namsan Mountain for postcard-worthy views. Enjoy a picnic or relax at Palgakjeong pavilion or Namsan library. What was once Korea’s largest hanbok (traditional clothing) and silk market is now the country’s hottest street food destination, with more than 200 places to eat and countless snacks to choose from. Must-eat local specialties include mayak kimbap and nokdu bindaetteok (Korean-style pancake). Saved from demolition and lovingly restored by specialized craftsmen, this inn embodies traditional Korean esthetics with a square courtyard and pavilion, a lotus pond and a fireplace. The ancient folk music playing in the background will leave you feeling like a pre-modern Korean aristocrat. From its perch on Namsan Mountain, this high-end hotel is perfectly located for sampling the city’s soju bars, bulgogi houses and noodle joints. The 426 rooms feature modern wood furnishings and Molton Brown bath products. Request a windowside table at La Yeon – Seoul’s first Michelin three-star restaurant – for views from the 23rd floor. The five-star Grand Hyatt Seoul is more resort than hotel, with its 12 restaurants and bars and extensive spa, yet it’s only a short drive from downtown Seoul. Enjoy a workout in the outdoor lap pool; then spiff up for a nighttime poolside barbecue overlooking the Han River. Wrap up your evening in the lobby bar with champagne cocktails and bing soo – Korea’s shaved ice, fresh fruit and ice cream delicacy. The concierge at this 83-room boutique hotel guides travellers to the sixth-floor lobby, where tones of black and white pay homage to the city’s cinematic past. Located in Myeong-dong, Seoul’s cultural hub, Hotel 28 is the ideal spot for guests looking to shop, eat and experience the nightlife. If you’re in the mood to splurge, book the Director’s Suite, decorated with Hermès furniture, fabric and tableware. The brainchild of a number of Hong Kong designers – including Andre Fu, famous for his minimalistic designs – this 317-room property is located in the heart of the city. Combining traditional Korean motifs with modern touches like floor-to-ceiling windows and white marble bathrooms, the spacious rooms make for a relaxing refuge. Try the Pan American Punch, made from gin, jasmine, vermouth and champagne at Charles H., the speakeasy bar hidden beneath a staircase. This high-end Marriott property puts you in the city’s entertainment and fashion district, where bright facades of clothing and textile shops line the streets. Head to Tavolo 24, the hotel’s buffet restaurant, to admire architect Zaha Hadid’s out-of-this-world Dongdaemun Design Plaza. After dark, it glistens like a spaceship, thanks to the curved aluminum-panelled exterior. As a member of the Design Hotels collection, the Glad is renowned for its stark architecture and design; think exposed ceiling, brick walls, unique pendant lights and grey tones. Street signs guide guests to their rooms, which are adorned with quotes from thinkers like Shakespeare and Eleanor Roosevelt. There are several ways to travel from Incheon International Airport to downtown Seoul. Hop on the Airport Railroad Express (AREX), which operates two lines (the Express Train and the All-Stop Train) to avoid traffic. The Express Train gets you directly downtown in roughly 40 minutes for KRW14,800. Airport buses offer comfortable travel to most parts of Seoul. Purchase your ticket at the designated booth outside the arrival area. Taxis will take you between the airport and downtown for a flat rate that ranges from KRW54,500 to KRW74,000, depending on your destination. The subway is the easiest, fastest and cheapest way to get around (and it even has free Wi-Fi). Purchase a rechargeable T-Money card at any subway station and most convenient stores. A subway ticket purchased on T-Money costs KRW1,250. Buses in Seoul are efficient and punctual. There are four types of buses in the city, each differentiated by colour: Blue buses operate on major roads through the city; green buses travel short distances; red buses offer express routes to the suburbs; and yellow buses operate within specific districts. Ticket prices range from KRW900 to KRW2,300 depending on the bus line. All taxis in Seoul use a meter, with different starting rates for regular, deluxe, jumbo and international cabs, which offer service in English and Japanese. The base fare for a regular taxi averages around KRW3,000. All taxis accept cash and credit cards, and some even take T-Money. No tipping necessary. How to have fun in South Korean capital. 1. Rent a bike at one of several kiosks in Hangang Park (pictured), and pedal along the Han River for a great workout and city tour. 2. Traditional tea houses, narrow alleyways and other remnants of old Seoul can still be found in the art district of Insadong, home to a bevy of crafts and art galleries. 3. Namsan Park will give you a postcard view for your Instagram feed. Hike, walk or bike to the top of its namesake mountain or take the funicular and cable car to get there in a jiffy. 4. The neighbourhood of Dongdaemun never sleeps: Sample street food at the night market while loading up on art supplies and second-hand books. During the day, in nearby Myeongdong, get your brand-name fix at the department stores Lotte and Shinsegae, whose rooftop gardens provide respite from the street-level hustle. 5. Check the Visit Korea website to find out about everything from green tourism and upcoming K-pop performances to restaurant openings and public transportation schedules.